The Export to Easel JS window lets you flatten an image sequence of your animation. Even if you have a fully rigged puppet or a single drawing layer with your animation sequence, the outcome will still be a flattened output of each frame, grouped together in your sprite sheet. This allows for more flexibility and freedom of work as you have access to any tools or effect modules you want to use. However, this can result in heavier files depending on the length, complexity and export size of your animation. Programmers may be interested to note that the XML data exported by Harmony can be converted afterwards to a more optimized binary data structure. To convert XML to Binary format, use the Xml2Bin utility. This utility converts the XML data structure generated through the Toon Boom Harmony software to a compressed binary data structure. This utility is available in the gaming SDK under /HarmonySDK/Source/Utils/. Utills/macosx:­ Precompiled binary for Mac OSX. Utils/win32: ­ Precompiled binary for Windows. Utils/Xml2Bin/proj.mac/Xml2Bin.xcodeproj: ­ XCode project for Mac OSX. Utils/Xml2Bin/proj.win32/Xml2Bin.sln: Visual Studio 2010 solution for Windows. The C++ code that handles the data structure can be reused and parsed in your own code if you want to integrate with other game engines. Add the Game toolbar, by selectings Windows > Toolbars > Game. Run the script by clicking the Export to Easel JS button in the Game toolbar. The Export to Easel JS window opens. 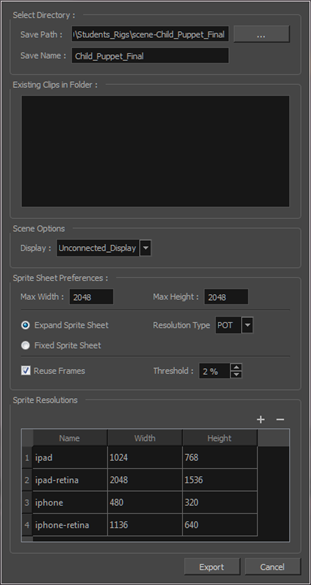 Set your sprite sheet preferences, see Export to Easel JS Dialog Box.